While on vacation at the beach, I read a book. That’s not to say that I had an iPad or a Kindle on the beach, but rather I read a paperback book in the air-conditioned comfort of the home in which we were staying. The electronic reading age is coming my way, I’m certain, but for now, flipping pages and inserting a bookmark “feels” like reading a book. 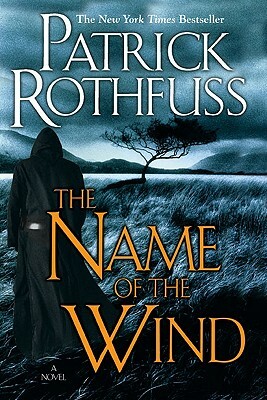 The book was, as listed above, The Name of the Wind. My wife recommended the book highly, as it had been recommended to her. I read the first 5 or so pages whilst otherwise making my way through the Sinatra biography, and I recognized quickly that the opening scene and writing style qualified as “something to set aside until I can really devote time to it.” At the beach (house), I did just that. It’s probably improper to sum my opinion before getting to the review, but what the heck: This is the book that every fantasy reader deserves. Sure, there’s good guys, bad guys, swords, magic, and the odd creature. But it’s not derivative of The Lord of the Rings (a model which many writers find hard to avoid), and it doesn’t attempt to cash in on popular subgenres (dragons, vampires, faeries, etc.). That’s good, in my opinion. The book presents an established hero, Kvothe, who carries with him legends of great deeds and, apparently, deeds gone wrong. Also, there is a hint of an ill-wind heading his way, but we never find out what that is. Why? Because if the author does lean to established fantasy traditions, this is the first book in a trilogy. It doesn’t make this book any less enjoyable. So, what then? The arc of the story isn’t made clear. Now subtitled “The Kingkiller Chronicles,” we’re not even introduced to a king. Instead, this is a coming-of-age story, told in our protagonist’s own words. They speak of a very observant, clever and humorous person, which is to say that Patrick Rothfuss, a first time author, is likewise gifted. Understanding that Kvothe is a hero currently struggling to be ordinary, we’re given a major glimpse of what, in super-hero terms, we would call “an origin story.” There’s no bite from a radioactive spider here. Instead, we’re told of how “the legend” that to whom we’re briefly introduced is undergirded with the realities of a very unusual and difficult teenage life. Kvothe is human – bold to the point of overconfidence, clever but foolish, romantic but naïve. Still, the author builds an incredibly entertaining story while presenting a fantasy world that is grounded in reason and reality. We understand the character’s progress through death, loss, poverty, hunger, friendship, humor, love, courage. The truth behind the legend is revealed, even if accidental or evolved over time. Ender’s Game – did I mention smart and clever (but without Ender’s guilt complex… (so far))? Throw in a bit of the Bean character as well. The Wheel of Time – Sure, I love the series, but this is opposite of that overly long work. Descriptive narrative is included, but it doesn’t consume 90% of the book leaving 10% of character action. Just the opposite. Thankfully. When reading books, I’m always looking for something that I didn’t know, or a really good quote, or something philosophical previously unconsidered.